We have previously reported that Stephen King’s ‘It’ is being remade into a theatrical film. It will be a two part film series with Cary Fukunaga directing. Fukunaga is most known for directing ‘Jane Eyre’. Fukunaga will also co-write the script with Chase Palmer who adapted Frank Herbert’s ‘Dune’ recently. Seth Grahame-Smith will be producing the picture according to THR. I’m on the fence about this project. I don’t have high hopes for this considering the crew. For those who don’t remember, ‘It’ was published back in 1986 and is considered one of Stephen King’s best books. The story follows a group of kids who are in a club called the Losers Club. The come across a creature called ‘It’ who disguises himself as a sadistic clown called Pennywise. 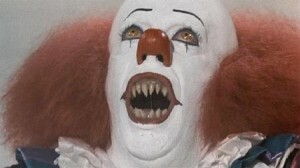 Pennywise preys on children throughout the story. Fast-forward to when these kids are adults, Pennywise starts to show up again, and all of them come back together to remember ‘It’ and fight it. The novel was made into a mini series that starred John Ritter and Tim Curry as Pennywise. Warner Bros. picked up the rights back in 2009 to this and has been wanting to make this since then. It’s going to be super tough to replace Tim Curry as Pennywise. My thought is that, Tim Curry is still around and lively. Cast him again once more to play Pennywise. He brought the meaning of true terror and horror to that character. Like I said, I don’t have high hopes for this, but hopefully I’m wrong. This entry was posted on Friday, June 8th, 2012 at 4:26 pm	and is filed under Film, News. You can follow any responses to this entry through the RSS 2.0 feed. You can skip to the end and leave a response. Pinging is currently not allowed. After seeing Seth Grahame-Smith’s script work on Dark Shadows, I’m not excited about him being involved with anything in moviedom, even if it is just producing. What I do like is the idea of two movies. This material needs the extra time as well as a better funded ending than the mini-series was able to provide. Will they do simultaneous filming? I’d love to see a 90-day break in releases as opposed to the standard six months to a year. « Bryan’s Bluray Review of ‘The Secret World of Arrietty’!! !